Home Opinion So what’s the next step? 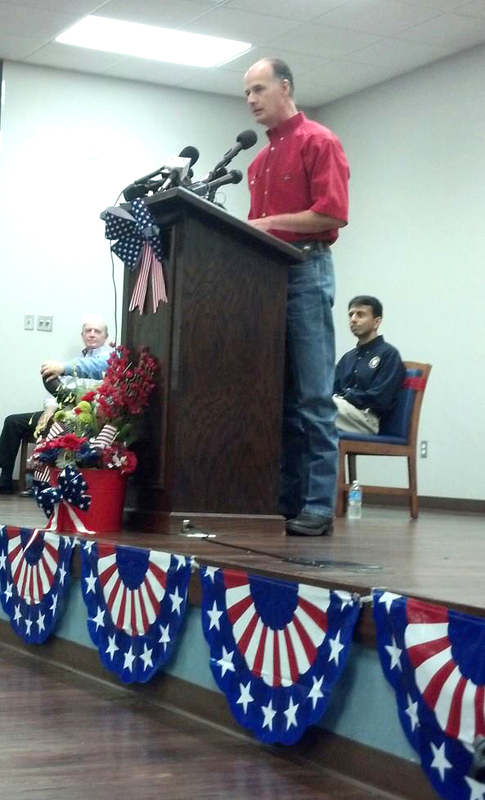 Sheriff Julian Whittington speaks during his "In God We Trust" Rally held July 4th. It’s been a week since Bossier Parish Sheriff Julian Whittington’s eminently successful “In God We Trust” rally. So what’s next? I visited the Sheriff’s Public Information Officer, Lt. Bill Davis, to ask that question. Davis said that as of now, our Louisiana Congressional delegation is taking the issue up at the federal level in an effort to determine if a resolution beyond the current “draw” is possible. And he clarified the point that funding for the Sheriff’s youth programs was not denied – instead, the Sheriff withdrew his grant application because of a requirement for him to sign a letter agreeing that prayer would not be part of a new youth program. A little history from Whittington’s May 23, 2013 letter to Governor Bobby Jindal helps clarify the issue. Davis said that a special account has been established for these donations – which are still coming in – and that the Sheriff’s office is waiting for a total to determine how to apply the funds. And Davis was very clear about the Sheriff’s plans to keep the public informed about new developments in this issue: “When we all go home from the rally, the Sheriff still has 120,000 Bossier Parish residents to answer to,” said Davis. We look forward to those periodic updates.